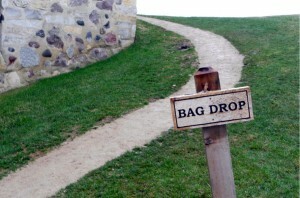 When it comes to selecting pathway materials for high traffic areas, there are plenty of options for buyers to consider. Concrete, asphalt, brick, and pavers are among the most common materials to use for high traffic hardscaping projects. Many of these applications are effective, but some can take a beating and chip and crack over time. Other applications require regular maintenance and may not be as friendly to the environment. As an architect, landscaper, engineer, or contractor, what is the best choice you can make for your project that’s better for the environment without sacrificing quality? The answer might be found in decomposed granite. 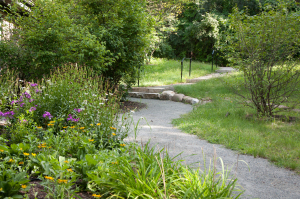 Decomposed granite is an ideal material for firm pathways where a natural look is preferred. It’s where hardscape meets softscape: a durable surface with natural qualities. Its resilience to high traffic wear and tear works well for pathways that carry pedestrians and vehicles on a daily basis. It is affordable, environmentally friendly, and an aesthetically pleasing alternative to traditional hardscape materials. Commonly known as DG, decomposed granite is granite that is naturally broken down into gravel and sand by millions of years of pressure underground. Solid quarry rock and recycled materials can also be carefully crushed, sized, and blended into aggregates that mimic decomposed granite composition, so you have even more natural colors to choose from. At Kafka Granite, we offer more than 50 different color options that are crushed and screened to the perfect size and gradation for your specific project. All of our naturally decomposed granite and crushed stone products are organic and environmentally safe. We blend these materials into three main variations for pathway applications: Standard Pathway Mix, Stabilized Pathway Mix, and Wax Polymer Pathway Mix. Let’s take an in depth look at how these pathway materials can be used for different high traffic project applications. Kafka Granite’s Standard Pathway Mix is generally screened to a fine ¼” minus size for a firm surface that compacts well and retains permeability. The specific gradation warrants maximum compaction while allowing water to permeate and drain through. Standard Pathway Mix provides the substantial durability of granite with a naturally beautiful look and feel that complements well with landscaping and architectural plans. It is suitable to use for smaller scale projects in areas such as nature paths, bike trails, courtyards, patios and residential driveways that have regular traffic. Stabilized Pathway Mix offers many of the same advantages of our Standard Pathway Mix, but is pre-blended with a natural stabilizing binder to create an even more firm, durable, and resilient pathway. Its strength is suitable for larger, high-traffic applications such as botanical gardens, golf cart paths, bike trails, nature paths, and commercial properties. Stabilized pathway mix offers better resistance to weather and traffic erosion than traditional pathway mixes, and it blends well to natural surroundings. Since binders work differently in variable conditions like local climate, individual aggregate type, and slope angles, Kafka Granite offers a choice between two kinds of binders for our Stabilized Pathway Mix – Organic-Lock and Stabilizer Solutions. Both binders are made from 100% natural materials that strengthen surfaces, reduce maintenance, and prolong the life of the pathway. 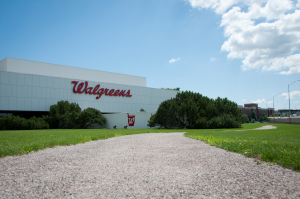 Our Wax Polymer Pathway Mix is a unique alternative to pavement that offers a waterless and dustless pathway solution. We combine the aggregate color of your choice with an engineered wax polymer for a sealed, non-permeable surface that does not get muddy or dusty. This unique mixture provides solutions for extremely high traffic areas, steep slopes, and other demanding pathway projects. The pre-mixed formula can be easily installed without water, and is easy to maintain. It allows greater creativity in design applications for architects and landscapers. At Kafka Granite, our state of the art crushing facility meets nearly any color and size specification. Through testing and approval, our sample lab and sales team will work with you to help you achieve your unique project goals. To learn more about our services and what we do, contact us for a free quote and complimentary product samples. We are also happy to give you a tour of our facilities or schedule a free Lunch and Learn presentation for your team. Our knowledgeable sales team is ready to help you discover the solutions to your project needs. With Kafka Granite on your side, the possibilities are endless! 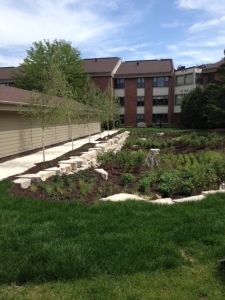 Sometimes designs require a quality pathway that blends well with the natural setting. Or perhaps you need a more environmentally friendly alternative to obtrusive concrete and asphalt. Kafka Granite offers a number of natural options for decomposed granite pathways. Each option offers an aesthetically pleasing and affordable alternative to the more traditional pavers, asphalt, concrete, or other hardscape materials. The three options you have to choose from for any commercial pathway in Minneapolis metro area are discussed here in more detail. Learning all you can about the different options will allow you to make an educated decision regarding which product is right for your particular needs. Decomposed granite, commonly referred to as DG, occurs naturally and is created through a process of compression that spans millions of years. As a result, the granite is broken down into a mixture of gravel and sand. When you browse our selection in this option you will find there are more than 40 different colors to choose from. Kafka Granite offers both naturally occurring decomposed granite, as well as a variety of granite, marble, quartz, and recycled materials that are carefully crushed to mimic the composition of DG. Both options – the naturally occurring decomposed granite and the crushed stone offered by Kafka Granite, are organic and therefore environmentally safe. Our mixture compacts well, which will create a firmer surface than traditional gravel options, while still allowing water to go through the surface. The standard pathways option is ideal for low traffic areas, such as garden trails, nature paths, residential driveways and walkways. This option includes decomposed granite, or crushed stone, that have been blended with an organic stabilizing binder. This process binds and locks the pathway mix in order to provide a permeable, durable, and completely natural surface. Due to the nature of the stabilized surface, this option better resists the erosive effects of traffic and water, compared to the more traditional gravel materials, while still offering a natural look that blends well into natural settings. The Stabilized Pathway Mix is often used for trails, golf course paths, greenways, nature paths, green roofs, botanical gardens, or any other environment where a much more organic feel is wanted. However, here at Kafka Granite we understand that each option is unique and therefore we can provide a unique solution. There are two different binding options to choose from, including Stabilizer Solutions and Organic Lock. Different scenarios call for different binders and we will help you determine which option is right for your particular project. This option features a combination of granite, marble, quartz, or recycled materials with an added engineered polymer. The process used to create this option is completely waterless and offers a popular paving alternative. Also, this option offers the added benefit of being a completely non-permeable, sealed, and dustless natural surface for plazas, driveways, golf cart paths, patios, and pathways. The unique process provides for a much larger amount of creativity in terms of design applications and offers solutions for projects that are heavily traveled. The Wax Polymer Pathway option is always pre-blended, which ensures an easy installation process. Minimal maintenance is also required and no water is necessary for the product. All you have to do is lay the material, level it onto the surface, and then compact it. Once applied, it is able to be dug up and then re-laid when necessary to provide subsurface access to various utilities, or for a site plan modification and maintenance. Another extremely appealing feature of this option is that the Wax Polymer Pathway is completely dustless and it will not get muddy. When you consider the options that are available, you can clearly see why Kafka Granite is a leader in the industry. Browse the available options and discuss them with our industry professionals to find the right solution for your particular project. When it comes to commercial or residential pathways in Minneapolis, finding the right material is essential. We can walk you through the process, step by step, to ensure you achieve the results you desire. This is one of our most natural options for a pathway. This decomposed granite occurs naturally when granite has been compressed for millions of years, causing it to break down overtime. At Kafka Granite, we not only offer a variety of colors of naturally decomposing granite, but we also offer over 40 different colors of crushed quarry rock as well as recycled materials to very carefully mimic the composition of DG. If you’re looking to use decomposed granite for a higher traffic area, we suggest using Stabilized Pathway Mix instead to achieve a long lasting finish that further reduces mud, dust, and erosion. At Kafka Granite, we understand that every project has its own unique needs. That is why we offer two different types of stabilizing binders: Organic-Lock and Stabilizer Solutions. Kafka Granite’s sales representatives are experts in our products and stabilizing binders so you can be sure that they will personally help you find the material and binder that is right for your project. Don’t settle for anything less than the best materials and binders on the market. Don’t settle for anything less than Kafka Granite. Our Wax Polymer Pathway comes pre-blended, which is one less thing for you to worry about. You’ll never have to add water to the mixture in order to use it, just lay the material down, level the surface, and compact. When necessary, Wax Polymer Pathways can easily be dragged and re-compacted to bring new life to the surface or to perform minor repairs. This type of pathway mix is dustless and will never get muddy. Our representatives are here to help you find the right pathway material for your project. So why choose Kafka Granite? We provide quality customer service and our representatives are experts in both our products and pathway projects. Our materials are of the highest quality and provide a beautiful, long-lasting, and natural-looking finish. We have a variety of pathway materials to choose from that will give you the final look and durability you desire. And of course, because Kafka Granite has been around since 1979, so you know that we provide lasting value! Terrazzo is making a big comeback in architectural flooring. This centuries-old flooring is enjoying new life as architects and designers recognize its environmental friendliness, durability, and ageless beauty. Through Kafka Granite’s longstanding relationship with T&M Supply, terrazzo suppliers and contractors use Kafka aggregates in gorgeous flooring all around the country! Here’s the first in a series discussing some hot architectural trends. So let’s find out more about terrazzo style and terrazzo flooring aggregates! These floors began life over 1500 years ago as Venetian mosaic workers began carting home marble castoffs to create terraces at home. Their first floors were rough and hard on the feet, gradually being polished and worn smooth by time and use. Recognized for its glimmering beauty beneath the Italian sun, terrazzo gained its first advancement. Workers began to press the chips into a clay base, then ground and polish them to a high shine. The end result was stunning and durable and was in use often from that time forward. 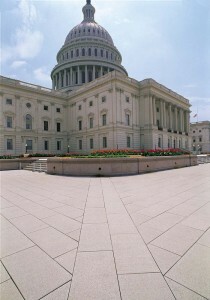 Terrazzo floors lay in St. Peter’s Basilica and even George Washington’s beloved Mount Vernon. In modern times, terrazzo hit a peak of popularity in the architecture of the 50s. Modern-style architects made frequent use of it in the southeast and southwest regions. A rising cost of installation saw a decline in its use at the start of the 70s. New manufacturing and installation techniques have helped bring the price down. An increased awareness of environmental sustainability makes terrazzo an attractive option. The flexibility, durability, and natural beauty of terrazzo promises it will continue to be a trendy option for decades to come. These floors are unquestionably beautiful. Their unmatched elegance and incredible durability have helped the technique survive to modern times. These floors use flexible metal divider strips that allow unlimited design opportunities. They can be set using Portland cement or thin set epoxy. The aggregates which make the bulk of the flooring come in a host of materials and colors, including granite, quartz, marble, mother of pearl, synthetic materials, and recycled glass. Epoxy can be tinted to match any color scheme. Imagination is the only limit in designing these floors. They can create unique shapes, logos, or patterns and match any décor. Current architectural design trends make elegant use of bold and dramatic color schemes. They also showcase the natural beauty of our earth’s stone aggregates. Terrazzo gives you the best of both worlds in an incredibly durable surface. Terrazzo offers a considerable return on investment. The structure of the material offers incredible durability. The epoxy terrazzo floors boast the lowest life-cycle cost of any hard floor surface. Terrazzo typically lasts as long as the structure it’s housed in. Terrazzo is also a low-maintenance material. Once installed and finished, the polished surface will maintain its look and beauty for decades to come even under heavy foot traffic. Epoxy terrazzo is also chemically resistant and more flexible than its predecessor while offering heavy compression strength. Used indoor or out, terrazzo also makes fantastic bar tops, counters, table tops, and vanities. Terrazzo, like many hard floor options, can be slippery. When used in areas with small children or the elderly, consider applying a non-slip adhesive to the surface. With its origins as a recycled product, terrazzo has always been a sustainable flooring. These days, terrazzo’s regional sourcing, durability, indoor air quality only add to its value. Use of recycled content such as porcelain, glass, and mirror in terrazzo flooring can help a building achieve LEED certification. These floors last for decades with remarkably low maintenance needs. An annual stripping and resealing can help extend the lifespan with ecologically friendly water-based products and regular maintenance is as simple as dry and damp mopping and semi-regular spray buffing. They can withstand heavy traffic without regular replacement. Terrazzo is mostly composed of naturally occurring or recycled materials. The granite, quartz, and marble chips are naturally occurring materials specially crushed and dried for use in epoxy terrazzo floors. Porcelain, glass, and mirror chips have a similar origin, but rather than being quarried, can come from factory cast-offs or recycled material. Even the dividing strips and steel substructure can incorporate recycled metals. The extreme longevity and low energy usage required for maintaining these beautiful floors grants them highly favorable embodied energy for their life cycle, meaning the energy used to create and sustain them is lower than other flooring options. Consumers are becoming more aware and concerned about the off-gassing habits of the products in their homes and places of business. The components of terrazzo, whether they are cement or thin set epoxy based, have zero-VOC materials. This means a finished floor with little to no off-gassing. Terrazzo is also free of moisture, mold, and microbial growth since it offers a non-porous surface. The end result is a product that does not contribute to poor air quality. Terrazzo helps create a stylish, unique look in any space, whether a custom home with dramatic flair or the lobby of a high-rise building. 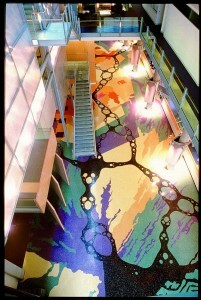 The unique properties of terrazzo make it an artist’s medium, allowing for unending design options. The proven durability terrazzo is showcased in its age; this is a product that improves as it ages and lasts a lifetime. With considerable environmental benefits during its manufacturing process and beyond, it is a material you can feel good about using. Terrazzo helps builders achieve LEED status and safeguards the health of those in buildings it resides in. Regardless of placement, terrazzo offers the best of all worlds – stunning design, remarkable durability, and environmental sustainability.